When we woke up this morning, we realized that the aches we were feeling were not entirely related to the workout we have been doing. We both started feeling chills/feverish, along with headaches/dizziness. We decided to take it easy today and did not plan too many things to do. 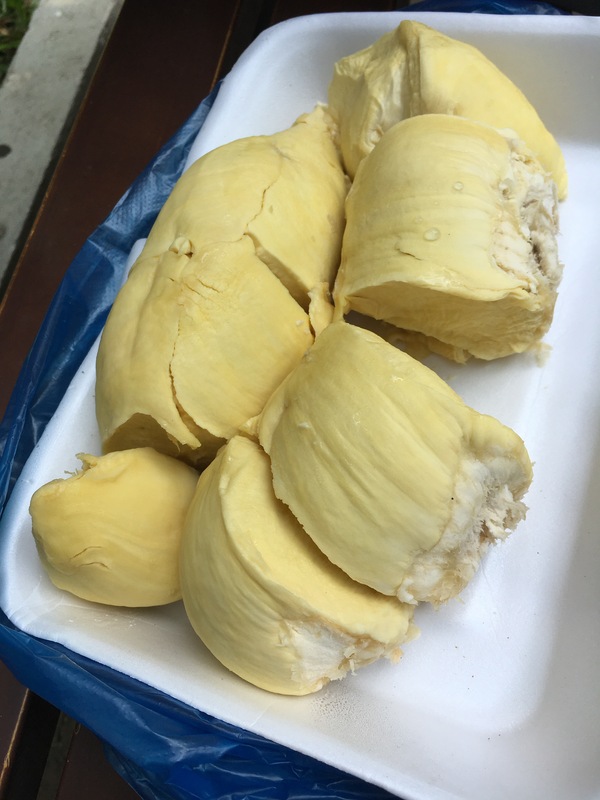 For breakfast, we decided to eat our gift, the durian, before its scent spread throughout the fridge too much. We brought it to a nearby park and enjoyed it with passersby staring at us. We decided that was not much of a breakfast, so we went to get some Bun Moc – yet another noodle soup dish with rice vermicelli in a mushroom and pork-based broth. In addition to the huge piece of pork bone with a surprising amount of meat attached to it, there was an assortment of other meats – including ham and meatballs. Overall, the taste was more plain compared to the other noodles we’ve had so far. I appreciated the assortment of meats, especially the huge pork bone. This is actually not a bad soup for us to have given we both weren’t feeling so well as the flavours were not overbearing. 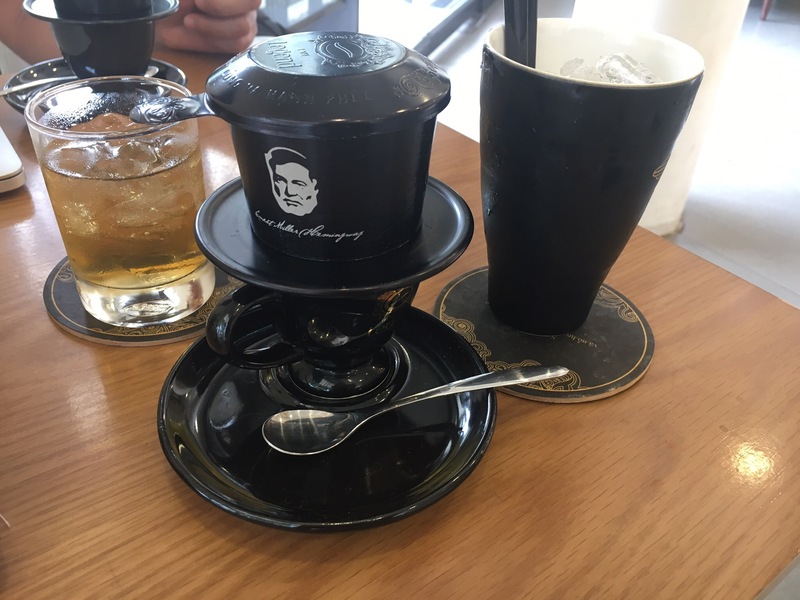 After grabbing some delicious Vietnamese coffee and doing some work at a gourmet coffee shop – Trung Nguyen Coffee, we headed home to get some rest before heading out again to meet up with my cousins for dinner. I finally have the chance to meet my other cousin who lives here! She was the only other female in my generation of the family tree, so we bonded immediately, even though we had a language barrier. (She did not speak Cantonese, only Vietnamese and some English.) We went to a BBQ restaurant called Suon Cay. The menu was impressive with pages after pages of meats, seafood and vegetables. There were charcoal grills in front of us and plates and plates of food arrive for us to cook over the grill. 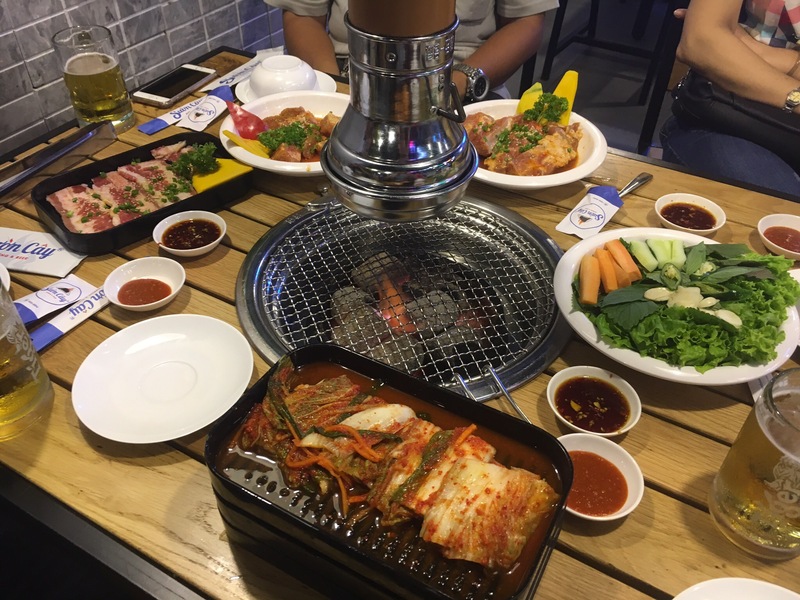 This was similar to previous Korean BBQ experiences I’ve had in Canada except the quality of the meat and seafood was better, as well as the marinade used. Looking around us, this appears to be a more upscale restaurant frequented by locals who wanted to try something different. Apparently, they also served hot pots as well but we were very full by the end of the BBQ feast. After dinner, my cousins drove us home on the backs of their motorbikes again. It was a less scary experience this time and I felt less of a need to hang on at all times. Progress! Sorry today’s post was not as long and exciting. Our adventures will continue once our health recovers!